The present real-life study FREE (Follow-up of glaucoma patients tReated with Prostaglandins EyEdrops) assessed the efficacy and tolerability after 12 months of therapy with PF latanoprost compared to that of preserved eye drops in patients with glaucoma as well as patient satisfaction and local tolerability at inclusion and after 6 months. This was a multicenter, international, prospective, non-interventional real-life study conducted between January 2014 and July 2016 in 300 ophthalmological private practice settings in France, the Netherlands, Norway, Poland, and Sweden. Investigators were selected on the basis of feasibility and representative geographical distribution. 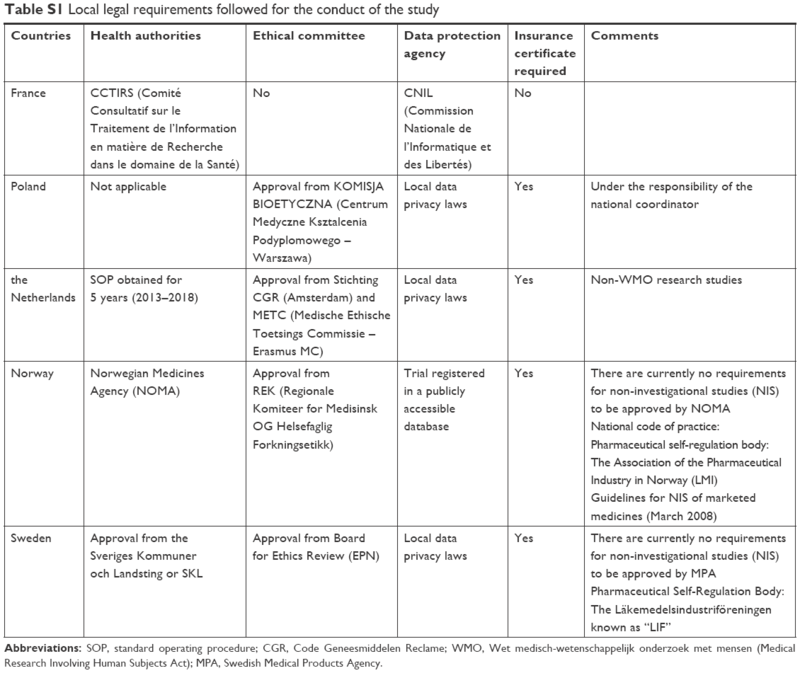 The study was conducted in compliance with the recommendations for Good Epidemiological Practice issued by the International Epidemiological Association and legal local requirements for the conduct of epidemiological studies.16 Approval from ethic committees were obtained for Poland (KOMISJA BIOETYCZNA, Centrum Medyczne Ksztalcenia Podyplomowego – Warszawa), the Netheralands (Stichting CGR, Amsterdam and METC, Medische Ethische Toetsings Commissie – Er), Norway (Regionale Komiteer for Medisinsk OG Helsefaglig Forkningsetikk), and Sweden (Board for Ethics Review, EPN), while no ethic’s committee approval was required for France. Detailed information about local legal requirements followed for this study is provided in Table S1. According to local legal requirements, written informed consent was obtained from patients in Poland prior to the data collection; patients from all other countries received written information but were not required to provide written informed consent. Handing out of the information letter was documented in the case report form. Each participating ophthalmologist had to include up to 10 patients aged 18 years or older with a documented diagnosis of glaucoma or ocular hypertension according to the guidelines of the European Glaucoma Society.6 Patients who were included sequentially in the study had to have a glaucoma stabilized with any topical treatment and received oral information and an information letter. Moreover, patients should have provided oral, and where required, written informed consent. The study planned for three visits. Inclusion visit and the first follow-up visit after 6±2 months (follow-up visit 1) were to be attended by all included patients. According to French health authority requests for efficacy and safety follow-up, patients from France were not to attend follow-up visit 2, 12±2 months after inclusion. Thus, this visit was only to be performed by patients from the Netherlands, Norway, Poland, and Sweden, thus prolonging the follow-up duration for 6 more months. These data were used for the 12-month follow-up. Demographic and glaucoma data of all participating patients were collected at inclusion. At all three visits, ophthalmologists collected information about glaucoma treatments used the day of the visit, treatment changes, and concomitant use of tear substitutes. Moreover, ophthalmologists assessed in each eye and at all visits IOP and local tolerance through the occurrence of OSDs, BUT (classified into three groups: <5 seconds, 5–10 seconds, and >10 seconds), conjunctival hyperemia, and fluorescein staining, as well as chemosis, lid redness, scaling, or swelling. Symptoms assessed by patients on a 4-point scale (absent, mild, moderate, or severe) included blurred vision and pain or discomfort at instillation, foreign body sensation, burning, dry eye sensation, itching, photophobia, red eye, tingling, and watering between instillations. Patient satisfaction concerning local tolerance to treatment was assessed at inclusion and follow-up visit 1 on a continuous VAS from 0 (bad tolerance) to 100 (good tolerance) by the patient. Moreover, the ophthalmologist asked the patient to rate on a 4-point scale ranging from very satisfied to very unsatisfied his/her satisfaction and reported the answer on the case report form. Patient satisfaction of treatment handling was assessed on the same scale at follow-up visit 1. Statistical analyses were performed with SAS® version 9.3 or more for Windows. Continuous variables were described in terms of number, mean, and SD. Categorical variables were described in terms of absolute frequency and percentage by group. If applicable, a 95% CI was calculated. Logistic regression was used to determine whether patient satisfaction was related to other variables. ORs and P-values (both adjusted for multiple comparisons and non-adjusted) were reported. In total, 757 patients were recruited: 552 from France, 98 from Poland, 43 from the Netherlands, 40 from Sweden, and 24 from Norway. Data from 721 patients at inclusion, from 702 patients at follow-up visit 1, and data from 240 patients at follow-up visit 2 were suitable for statistical analyses. Thirty-six (36) patients were excluded from the Full Analysis Set (FAS) population due to non-respect of inclusion criteria. The overall mean age at inclusion was 66.6±10.92 years, and 59.2% were females. A very large majority of patients (92.5%) had primary open-angle glaucoma. Mean duration of glaucoma was overall 6.9±6.15 years and merged mean IOP was 17.3±3.68 mmHg. A majority of patients (63.0%) used previous glaucoma treatments prior to their current treatment; 3.2% had already used PF latanoprost. Overall, 64.8% (467/721) of patients switched treatment before inclusion, 62.2% in the preserved and 68.9% in the PF latanoprost group. The most common glaucoma treatments were preserved beta-blockers (21.2%), preserved latanoprost (20.7%), preserved travoprost (9.8%), PF beta-blockers (7.8%), and preserved bimatoprost 0.01% (5.6%). Treatment was changed for an average of 2.2±1.57 times. Main reasons for changing treatment were insufficient efficacy (48.1%) and local intolerance (46.4%). Detailed patient demographic and disease data at inclusion are provided in Table 1. The mean IOP remained stable and similar during the long-term follow-up in both the preserved treatment and PF latanoprost groups. Mean IOP values at all visits for preserved eye drops and PF latanoprost eye drops are provided in Figure 1. Figure 1 Intraocular pressure at inclusion, follow-up visit 1, and follow-up visit 2 of patients with preserved eye drops and preservative-free latanoprost eye drops. A subgroup analysis in patients treated for 12 months with PF latanoprost confirmed that the mean IOP remained stable with 16.9±3.1 mmHg at inclusion and 16.8±3.9 mmHg at follow-up visit 2. The prevalence of OSDs was always lower for patients using PF latanoprost than for those using preserved eye drops. At inclusion, the prevalence of patients with OSDs was lower in the PF latanoprost group (56.8%) than in the preserved eye drop group (76.0%). At follow-up visit 1, the prevalence of patients was 69.6% and 87.0%, respectively. At follow-up visit 2, the prevalence of patients with OSDs had further decreased to 27.7% of patients in the PF latanoprost group and to 33.7% in the preserved eye drop group. The prevalence of patients with no conjunctival hyperemia was significantly higher (P=0.0015) at all study visits for patients using PF latanoprost compared to those using preserved eye drops at all study visits. At inclusion, the prevalence of patients with no conjunctival hyperemia was higher in the PF latanoprost group (67.2%) than in the preserved eye drop group (41.3%). At follow-up visit 1, 77.5% of the patients in the PF latanoprost group and 52.3% of the patients in the preserved group had no conjunctival hyperemia. At follow-up visit 2, the prevalence of patients with no conjunctival hyperemia had further decreased in both groups with 72.4% in the PF latanoprost group and 45.8% in the preserved group (P<0.0015). Figure 2 details the prevalence of patients with no conjunctival hyperemia at inclusion and both follow-up visits. Figure 2 Prevalence of patients with no conjunctival hyperemia at inclusion, follow-up visit 1, and follow-up visit 2. Note: The difference between the two treatment groups was statistically significant (P=0.0015) at all visits. A large majority (more than 80.0%) of all patients had no other ocular signs of local intolerance observed, at any visit. For patients in the PF latanoprost group, BUT remained stable over time. The prevalence of patients with a BUT of more than 10 seconds was always higher in patients in this group than in the preserved group. At inclusion, 36.7% of patients in the PF latanoprost group and 22.8% of patients in the preserved group had a BUT of more than 10 seconds. At follow-up visit 1, a BUT of more than 10 seconds was observed in 35.9% of the patients in the PF latanoprost group and in 28.7% of the patients in the preserved group. A further improvement was observed at follow-up visit 2; in the PF latanoprost group, a BUT of more than 10 seconds was observed in 36.7%, while in the preserved group, it was observed in 35.6% of patients. The prevalence of patients with no ocular symptoms upon and between instillations was always higher in the PF latanoprost group than in the preserved group. 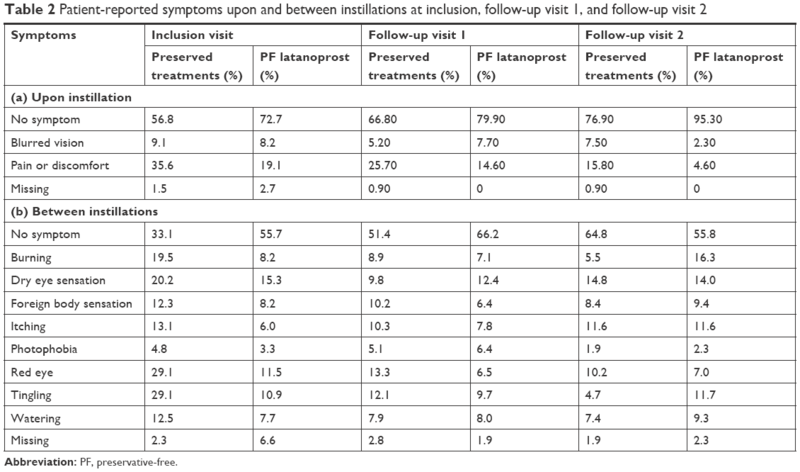 At inclusion, 72.7% of the patients in the PF latanoprost group and 56.8% in the preserved group reported no ocular symptoms upon instillation. A total of 35.6% of patients in the preserved group and 19.1% of patients in the PF latanoprost group reported pain or discomfort. At follow-up visit 1, the prevalence of patients reporting no ocular symptoms upon instillation was 79.9% in the PF latanoprost and 66.8% in the preserved group. At follow-up visit 2, the prevalence of patients with no ocular symptoms upon instillation was higher in the PF latanoprost (93.5%) and remained lower in the preserved group (76.9%). Details are provided in Table 2. 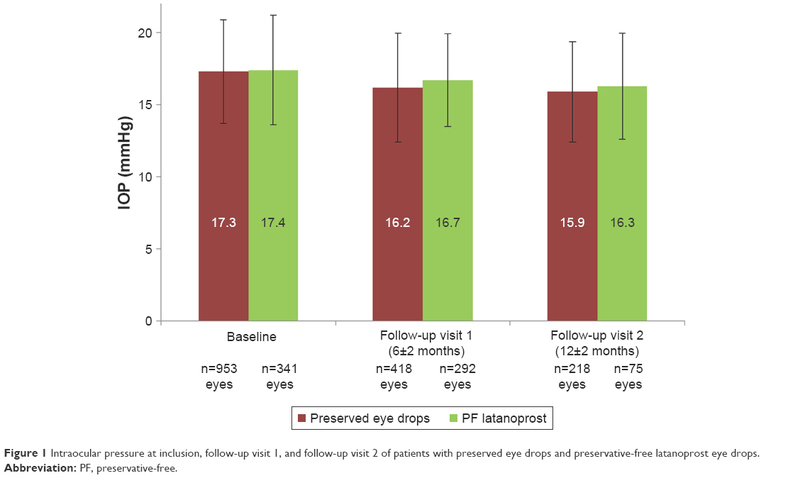 At inclusion, 55.7% of the patients in the PF latanoprost and 33.1% of the patients in the preserved group reported no ocular symptoms between instillations. The most common symptoms observed in the preserved group were red eye and tingling (29.1% each), while dry eye accounted for 20.2%. Conversely, in the PF latanoprost group, common incidences were dry eye sensation (15.3%), red eye (11.5%), and tingling (10.9%). At follow-up visit 1, a total of 66.2% of the patients in the PF latanoprost and 51.4% in the preserved group had no ocular symptoms reported. The incidence of blurred vision remained unchanged or was less commonly reported by patients treated with PF latanoprost (6.1%) compared to patients using preserved treatments (8.4%). The prevalence of patients reporting increased or unchanged pain or discomfort was lower with PF latanoprost (14.2%) than for patients using preserved treatments (25.7%). At follow-up visit 2, the incidence of ocular symptoms reported at follow-up visit 1 remained similar for both groups. Severity of ocular symptoms remained unchanged at both follow-up visits and in both groups. At inclusion, 39.9% in the preserved and 33.3% in the PF latanoprost group used tear substitutes adjunctively to their glaucoma treatment. PF artificial tears (66.8%) were the main tear substitutes. At follow-up visit 1, 49.5% of patients who switched to PF latanoprost declared having decreased or stopped the concomitant use of tear substitutes. A total of 34.4% who continued their treatment with preserved glaucoma treatment also declared that they continued the use of artificial tears; 31.6% used preserved and 68.4% PF artificial tears. At inclusion, the mean VAS value for the PF latanoprost group was 85.5±15.37 and 81.7±20.3 for the preserved group. At follow-up visit 1, the mean value on the VAS scale had slightly increased in the PF group (87.9±9.75) and remained unchanged in the preserved group (81.7±20.3). 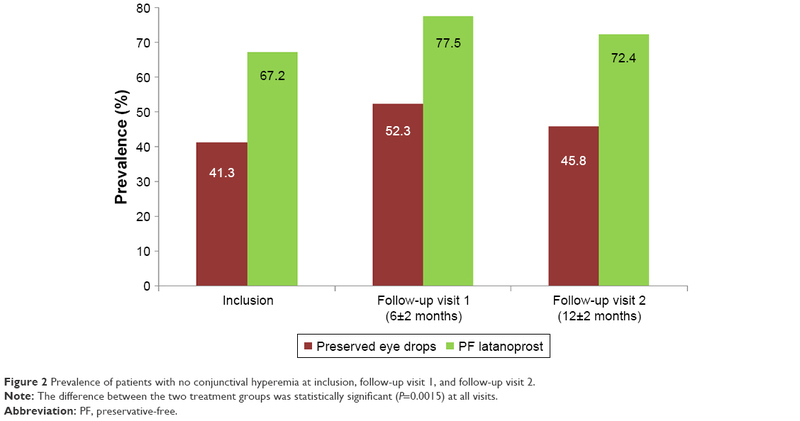 The proportion of patients satisfied or very satisfied regarding tolerance to their current glaucoma treatment at inclusion was 88.6% in the PF latanoprost and 64.6% in the preserved group, and the difference was statistically significant (P<0.0001). Overall, 88.9% of the patients who switched to PF latanoprost after follow-up visit 1 were satisfied or very satisfied regarding the local safety of their new treatment compared to 42.5% who remained on preserved treatment. The difference was statistically significant (P<0.0001). At inclusion, the prevalence of satisfied or very satisfied patients with the handling of their glaucoma treatment was 91.3% for patients in the PF latanoprost and 89.6% for patients in the preserved group; it was 96.1% and 64.8% at follow-up visit 1, respectively. Patients using PF latanoprost were considerably more satisfied regarding their tolerance to treatment than those using preserved eye drops. The difference was statistically significant (P<0.0001) at inclusion and after 6 months for those patients who switched from preserved to PF latanoprost between inclusion and follow-up visit 1, emphasizing the good tolerance profile of PF latanoprost through the absence of preservatives and their well-described toxicity.9,24 Furthermore, patients rated PF latanoprost eye drops more convenient to use than preserved eye drops regarding handling. In conclusion, this first real-life study confirmed the clinical benefit of PF latanoprost and its better local tolerance over preserved eye drops over a sustained period of 12 months. PF latanoprost provided a significantly higher patient satisfaction, thus potentially allowing improvement in the patient’s daily life. The authors acknowledge the participation of the members of the FREE Study Group for patient recruitment, follow-up, and collection of data. The authors received honoraria from Laboratoires Théa for their participation in the study and are consultants to Laboratoires Théa. The authors report no other conflicts of interest in this work. Support in study conduct was provided by Iris Pharma, La Gaude, France. Statistical consulting was provided by CAPIONIS, France, and assistance in manuscript preparation was provided by Karl Patrick Göritz, SMWS, France; all companies were compensated by Laboratoires Théa. van der Valk R, Webers CA, Schouten JS, Zeegers MP, Hendrikse F, Prins MH. Intraocular pressure-lowering effects of all commonly used glaucoma drugs: a meta-analysis of randomized clinical trials. Ophthalmology. 2005;112(7):1177–1185. Arias A, Schargel K, Ussa F, Canut MI, Robles AY, Sánchez BM. Patient persistence with first-line antiglaucomatous monotherapy. Clin Ophthalmol. 2010;4:261–267. Eyawo O, Nachega J, Lefebvre P, et al. Efficacy and safety of prostaglandin analogues in patients with predominantly primary open-angle glaucoma or ocular hypertension: a meta-analysis. Clin Ophthalmol. 2009;3:447–456. Honrubia F, García-Sánchez J, Polo V, de la Casa JM, Soto J. Conjunctival hyperaemia with the use of latanoprost versus other prostaglandin analogues in patients with ocular hypertension or glaucoma: a meta-analysis of randomised clinical trials. Br J Ophthalmol. 2009;93(3):316–321. Alm A. Latanoprost in the treatment of glaucoma. Clin Ophthalmol. 2014;8:1967–1985. European Glaucoma Society Terminology and Guidelines for Glaucoma, 4th Edition – Chapter 2: Classification and terminology Supported by the EGS Foundation: Part 1: Foreword; Introduction; Glossary; Chapter 2 Classification and Terminology. Br J Ophthalmol. 2017;101(5):73–127. Jaenen N, Baudouin C, Pouliquen P, Manni G, Figueiredo A, Zeyen T. Ocular symptoms and signs with preserved and preservative-free glaucoma medications. Eur J Ophthalmol. 2007;17(3):341–349. Rouland JF, Traverso CE, Stalmans I, et al; T2345 Study Group. Efficacy and safety of preservative-free latanoprost eyedrops, compared with BAK-preserved latanoprost in patients with ocular hypertension or glaucoma. Br J Ophthalmol. 2013;97(2):196–200. Feldman RM. Conjunctival hyperemia and the use of topical prostaglandins in glaucoma and ocular hypertension. J Ocul Pharmacol Ther. 2003;19(1):23–35. Jones L, Downie LE, Korb D, et al. TFOS DEWS II Management and Therapy Report. Ocul Surf. 2017;15(3):575–628. Nordmann JP, Auzanneau N, Ricard S, Berdeaux G. Vision related quality of life and topical glaucoma treatment side effects. Health Qual Life Outcomes. 2003;1:75. Zimmerman TJ, Hahn SR, Gelb L, Tan H, Kim EE. The impact of ocular adverse effects in patients treated with topical prostaglandin analogs: changes in prescription patterns and patient persistence. J Ocul Pharmacol Ther. 2009;25(2):145–152. Aptel F, Choudhry R, Stalmans I. Preservative-free versus preserved latanoprost eye drops in patients with open-angle glaucoma or ocular hypertension. Curr Med Res Opin. 2016;32(8):1457–1463. Cucherat M, Stalmans I, Rouland JF. Relative efficacy and safety of preservative-free latanoprost (T2345) for the treatment of open-angle glaucoma and ocular hypertension: an adjusted indirect comparison meta-analysis of randomized clinical trials. J Glaucoma. 2014;23(1):e69–e75. IEA. International Epidemiological Association: Good Epidemiological Practice (GEP), IEA Guidelines for properconduct in epidemiological research, November 2007; Available from: http://ieaweb.org/good-epidemiological-practice-gep/. Accessed March 7, 2018. Lemij HG, Hoevenaars JG, van der Windt C, Baudouin C. Patient satisfaction with glaucoma therapy: reality or myth? Clin Ophthalmol. 2015;9:785–793. Muñoz Negrete FJ, Lemij HG, Erb C. Switching to preservative-free latanoprost: impact on tolerability and patient satisfaction. Clin Ophthalmol. 2017;11:557–566. Martinez-de-la-Casa JM, Perez-Bartolome F, Urcelay E, et al. Tear cytokine profile of glaucoma patients treated with preservative-free or preserved latanoprost. Ocul Surf. 2017;15(4):723–729. Pisella PJ, Pouliquen P, Baudouin C. Prevalence of ocular symptoms and signs with preserved and preservative free glaucoma medication. Br J Ophthalmol. 2002;86(4):418–423. Wilson WS, Duncan AJ, Jay JL. Effect of benzalkonium chloride on the stability of the precorneal tear film in rabbit and man. Br J Ophthalmol. 1975;59(11):667–669. Jee D, Park SH, Kim MS, Kim EC. Antioxidant and inflammatory cytokine in tears of patients with dry eye syndrome treated with preservative-free versus preserved eye drops. Invest Ophthalmol Vis Sci. 2014;55(8):5081–5089. Pauly A, Roubeix C, Liang H, Brignole-Baudouin F, Baudouin C. In vitro and in vivo comparative toxicological study of a new preservative-free latanoprost formulation. Invest Ophthalmol Vis Sci. 2012;53(13):8172–8180. Newman-Casey PA, Blachley T, Lee PP, Heisler M, Farris KB, Stein JD. Patterns of Glaucoma Medication Adherence over Four Years of Follow-Up. Ophthalmology. 2015;122(10):2010–2021. Thygesen J. Glaucoma therapy: preservative-free for all? Clin Ophthalmol. 2018;12:707–717. Abbreviations: SOP, standard operating procedure; CGR, Code Geneesmiddelen Reclame; WMO, Wet medisch-wetenschappelijk onderzoek met mensen (Medical Research Involving Human Subjects Act); MPA, Swedish Medical Products Agency.